A Japanese court has ordered the operator of the Fukushima nuclear plant to pay damages to the family of an evacuee who killed herself. Tokyo Electric Power Company (Tepco) will pay the family of Hamako Watanabe 49 million yen (£284,000, $472,000). Ms Watanabe killed herself after she was forced to leave her home due to radioactive contamination. The plant was badly damaged by the March 2011 tsunami, which knocked out cooling systems to reactors. The case could open the way for many others to sue Tepco for compensation, says the BBC's Rupert Wingfield-Hayes. In June 2011, three months after the plant's failure, Mrs Watanabe and her husband Mikio were forced to evacuate their home because of radioactive contamination. Their home in Kawamata town was about 40km from the plant. The family moved to an apartment in Fukushima city. Weeks later Mrs Watanabe, 58, doused herself in kerosene and set herself on fire. Her husband and three children sued Tepco for 91 million yen. They claimed the evacuation was responsible for a deterioration of Mrs Watanabe's mental state because she did not know when she could return home, according to Kyodo news agency. The chicken farm where she and her husband were working also closed. Following the verdict, Tepco released a statement reiterating that it was sorry for the accident and said it would study the verdict and "respond in a sincere way". "We pray that Hamako Watanabe has found peace," the company added. Mr Watanabe said he was "satisfied" with the court decision. It is not the first time Tepco has paid out compensation. It has settled a number of suicide-related claims through a government dispute resolution system, reports say, but this case is the first time a court has mandated Tepco should pay damages. 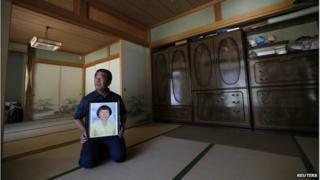 Dozens of Fukushima residents are reported to have killed themselves since the disaster, says our correspondent. Tens of thousand fled their homes and businesses because of radioactive contamination, with the majority still unable to return home. Fukushima: Is fear of radiation the real killer?